An interesting idea was brought to the attention of the Boston Bruins team of writers here on The Hockey Writers. Though the scenario proposed was entirely hypothetical, it was still one that sparked a conversation. The Bruins Stats Twitter account tweeted out a poll asking fans if they would send Brandon Carlo and the 18th overall selection in the 2017 NHL Entry Draft to the Colorado Avalanche in exchange for Matt Duchene. With reports that the Bruins are still interested in Duchene, a group of Bruins writers, including Chris Gere, Joe Ochs and Drew Johnson all sat down to discuss the topic. The Bruins do have an immediate need at left wing and Matt Duchene would certainly address that. However, the problem is that this team isn’t likely to contend next year with all of the young players acclimating to the NHL. The other problem is that most of the prospects the Bruins need to evaluate are left wingers. It would behoove them to spend this year taking proper inventory and making a deal next offseason if it’s still necessary. Theoretically, the solution to the Bruins’ second-line left wing problem could be one or more of Anders Bjork, Peter Cehlarik, Danton Heinen, Jake DeBrusk, or even Frank Vatrano. Another issue is Duchene’s contract. He carries a cap hit of $6 million and is only under team control for two more seasons. As recently as last offseason, the team’s greatest need was a top-four defenseman. To give up Brandon Carlo, who is both a top-four defenseman and a young, cheap asset under team control in addition to a first-round pick, would be a tough pill to swallow for just two seasons of Duchene. That said, Carlo should not be considered untouchable. Bruins fans may overrate him because he had a very good defensive season for a 20-year-old. However, he is almost entirely bereft of an offensive game, having tallied only 16 points in 82 games in his rookie year. 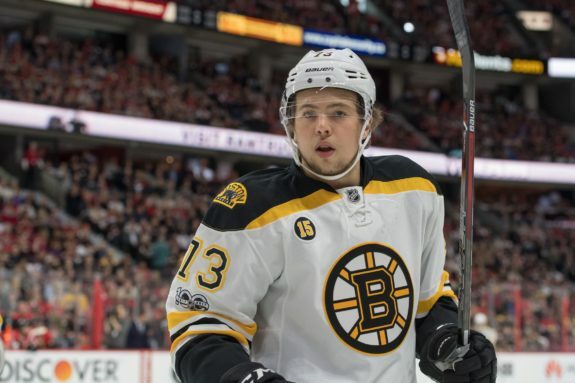 With Charlie McAvoy stepping in as a potential top-pairing right-shot defenseman for the foreseeable future, Carlo’s presence is less crucial. The guy I would target on the Avalanche would be Gabriel Landeskog. He’s a couple years younger, his contract is a little cheaper, and he’s locked up for the next four seasons. His offensive game isn’t as refined as Duchene’s, but he’s a good two-way player who could thrive on Krejci’s left side. Though I believe the trade proposed here is “fair” for both sides, it’s not a trade that I personally endorse. Sure, McAvoy is the future anchor of the unit. And no, I do not believe that Carlo is untouchable, nor am I overestimating his talent and ceiling. However, at just 20 years old, Brandon Carlo has already established himself as a legitimate top four defender. Those do not grow on trees, as Bruins fans can attest after having watched the team struggle so mightily on the back-end in each of the previous two seasons. The value of the proposed trade may be even, but the loss of Carlo would set off a domino effect throughout the rest of the team’s pairings. Couple that with the potential loss of another defenseman in the expansion draft and suddenly Boston’s blue line is once again patchwork/a work in progress. Furthermore, Matt Duchene’s $6 million cap hit would prevent Don Sweeney from addressing the position via free agency or trade. There are different trade paths the Bruins could travel to address their need for a top six left wing that does not require selling off a defender who serves as a current AND future fixture in their top four. Their back-end is just now rounding into shape, and Nashville is currently showing just how far a lethal top four can take a team. Carlo and the 18th pick for Duchene is merely robbing Peter to pay Paul; it creates as many problems as it solves. I’ll start by saying that this trade is very tempting. However, I can’t pull the trigger. Brandon Carlo was superb in his rookie season and I only see him getting better. I would not say he is untouchable, but I would say that a deal must be slanted in Boston’s direction for GM Don Sweeney to give it serious consideration. 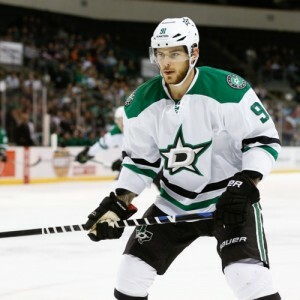 If the Bruins wanted a player like Duchene, they should have kept Seguin. If they wanted a player like Duchene, they shouldn’t have dropped $6 million on Backes. Carlo is already a top four defenseman and will remain so for the rest of his career, one can imagine. His offensive game will only improve in the future when he isn’t limited by Chara’s dreadful transition game. If the Bruins were to trade Carlo, I’m sure Sweeney would want the 18th overall to go ahead and draft another prospect to soften the blow. I would rather see Sweeney move the 18th over Carlo and certainly cannot endorse moving both. With that said, Duchene is an outstanding player and the Bruins need a top six forward. As I’ve attested to in previous articles, however, Boston is equipped to do so through Free Agency. Acquiring Duchene would only solve today’s problems, as there are plenty of prospects coming up the pike that could fill that top six need in just a handful of years. Sweeney could give up less for an older player who is just as skilled, giving guys like DeBrusk and Bjork time to break into Boston’s lineup. In closing, Bruins fans need a statement from management that they are committed to their prospects. Joe Thornton, Phil Kessel, Tyler Seguin, and Dougie Hamilton were all given the boot far too early. I don’t want to add Carlo to that list, especially when things like his cap hit and ego aren’t a problem. The idea of getting a player like Duchene in the lineup is tempting. So tempting, that the idea of moving Carlo sounds like a potentially good idea. With the Bruins having a bevy of right-shot defenders in their lineup, including McAvoy, Carlo, the two Millers and McQuaid, there is clearly a need to move at least one out. While teams would obviously rather avoid trading a player who is 20-years-old and has displayed signs of being a legitimate NHL defender, trades are a give-and-take business. If the Bruins are serious about getting a player like Duchene to complement their offensive production, a player like Carlo is undoubtedly going to be the cost. As mentioned by some of the other Bruins writers, however, this doesn’t necessarily solve the Bruins’ problems. By making a move to acquire Duchene and trading away both Carlo and a first-round draft pick, the Bruins are weakening their defensive depth. The top-four in Boston next season, as currently constructed, looks to feature Zdeno Chara, McAvoy, Torey Krug and Carlo. With the Vegas Golden Knights likely to take McQuaid or one of the two Millers, that leave the remaining two for a bottom-pairing role. 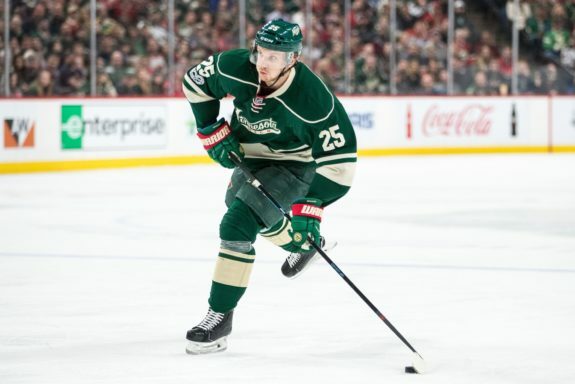 The Bruins are reportedly interested in acquiring Jonas Brodin from the Minnesota Wild – a defender who would bolster the top-four and in turn, solidify the bottom-pairing as well. The issue is that the asking price for Brodin will likely be a first-round pick. If the Bruins move Carlo and the 18th overall selection, they’re giving up a defender while also losing their trade chip to acquire another defender. If the Bruins can somehow work out a deal to acquire Brodin and Duchene while minimizing the costs, it’s something I could get behind. The likelihood of acquiring both of those players without giving up a significant enough return to cause outrage in the Bruins’ fanbase, however, is slim to none. It’s going to be a busy offseason in Boston that will likely make a lot of fans happy, and a lot of fans miserable, depending on how they value certain players, prospects and pick. Though Matt Duchene is a tremendously talented player, the Bruins should probably pass on a deal for him if the cost is Brandon Carlo. A 20-year-old right-handed defender who has already shown he can play in the NHL, Carlo has the potential to break out even further in his sophomore season. There’s no denying that a player like Duchene could do wonders to helps the Bruins offensive production outside of the Patrice Bergeron and Brad Marchand pairing. Still, that doesn’t mean that moving Carlo is the answer to this problem. If the Bruins had another blue-chip right-handed shot defender in their prospect pool other than McAvoy, the idea might have been more enticing. 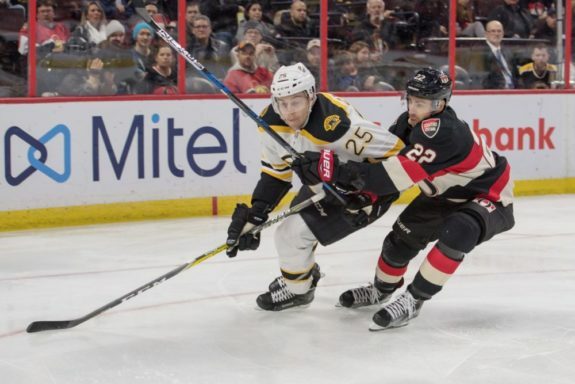 As it stands, the Bruins are loaded with prospects other positions, including left-handed blueliners – but no suitable replacement for Carlo left to be developed.